The last two weeks past by so fast! And in this my life article I take you with me to ao clouds of fashion. Because I went to their girl gang day! And for the rest I’m showing you other cool things, good food and I even been on the radio! Are you curious why? Then keep on reading! On Monday I went to the ikea. Mainly for the good and cheap veggie food, and their vegetable dumplings where so good! But also for a new small table for my product photography. And I also bought two awesome summery cocktail scents candles. And this was my outfit. I found this dress second hands and I couldn’t show it before because of the cold weather. But because the sun was shining a bit I choose to wear this beautiful dress! And I’m in love! But to be honest, when the sun was gone, this outfit was a bit to cold. Wednesday I brought my sweet mom a visited, because she asked me to take pictures for her. And after that we order a good and fresh ginger tea. And of course I also went by my mom her home, to see her amazing cat! Because I just love cats so much! And when I was home it was again time for some tea! This time I went for the pickwick, energy. This one is so good, but I can’t find it no more in the stores… Meeh, but I’m not giving up, because this was the perfect tea for me when I needed a boost. Yaay, it was finally time for new nails! And I don’t think that you wanna see the before photo, because that was real horror! So I’m happy that my nails are now pretty in pink! I’m busy with renovations at my home. And Monday evening I went to Antwerp! 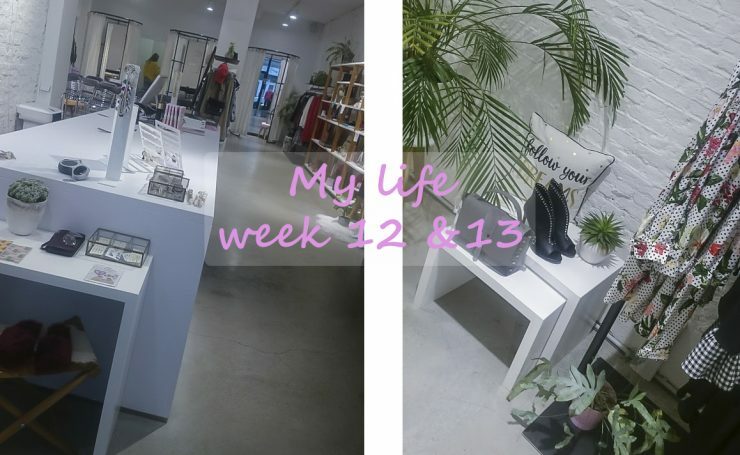 I was in Antwerp for the clouds of fashion, girlgangday- social media class from Laurentine. It was such an interesting night and after the reading we got her book ‘from blog to brand’ signed. And of course I bought something at store, some chokers (5 for €8) and a necklace. Saturday my boyfriend needed to photography a communion. And I wasn’t feeling it so I wanted to sit in the car for a bit. And their was a competition on the radio, and normally I don’t do this. But this time you had to send an SMS at the moment that song would play and tell them from witch artist it is. And because it was my tomorrowland song I toke a change and guess what… 5 minutes later they called me and told me I won the party CD! Yaah! Last but not least these lovely and good chocolate eggs from godiva! I got these onces and the one with strawberries flavor are so good! And this was it for today’s my life article! This week I have an appointment for laser hair removal for my armpits and also for the bikini line. For my armpits is almost my last session and for my bikini line is it the first one! I’m curious! Leuk om te zien! Ben benieuwd naar de geuren van de IKEA kaarsen. Als ik naar IKEA ga, neem ik ook altijd een paar geurkaarsen mee naar huis. Je nagels zien er mooi uit. En wat leuk dat je op MNM bent geweest en nog gewonnen hebt ook! Chocolate eggs from Godiva are the best. In fact, chocolate is always the best choice! Leuke overzicht!! En wat is je outfit leuk, ik houd van stipjes! Je kunt proberen de pen er nog vanaf te krijgen, met citroen, een gom, Dreft,… Mij is het ooit gelukt maar dat was niet zo’n grote vlek. Dankjewel voor de tip! Met citroen en een gom heb ik het nog niet geprobeerd dus dit ga ik straks eens uittesten!